Around the world and especially in the United States, people are finding new ways to turn the things they already have into new opportunities and even cash. Apartment swapping, where travelers exchange properties with each other for a frugal and comfortable place to stay, is the purest form of what has been coined the sharing economy. Air BnB takes out the straight sharing aspect, with a visitor simply paying the apartment owner to stay at their place. Since the apartment owner is making a profit from something they already own, it's still considered part of the sharing economy. The integration of sharing with the digital economy is evident with apps like Lyft and Sidecar, which let users request or offer up rides when it's convenient for them, and FlightCar, where travelers get a free ride to the airport and make cash renting out their cars until their return. Large cities are seeing a boom in parking spot sharing, workplace sharing and renting everything from sewing machines to weed whackers. The original rideshare program, Lyft was launched in 2012 to give drivers a chance to earn extra cash with their cars and passengers a chance to travel conveniently and affordably. Its origins come from Zimride, one of the founder's services designed to help students share rides home for the holidays. Lyft still provides a carpooling service as well as the consumer-driven app that lets anyone get a ride in minutes from their smart device. Lyft is now present in 65 cities, offering peer-to-peer service that lets you not only grab a ride with a Lyft driver, but share that ride with more Lyft users to drive down the price. Wherever you're headed, count on Lyft for rides in minutes. The Lyft app matches you with local drivers at the tap of a button. Just request and go. Whether you're riding solo or with friends, you've got options. Tap to request Lyft, Lyft Line, or Lyft Plus. Get picked up by the best. Their reliable drivers will get you where you need to go. Download the Lyft app for iPhone or Android, and get a friendly, affordable ride within minutes. Just tap a button, and you'll get picked up by a Lyft driver. When the ride ends, the app automatically charges your saved credit card. No need to carry cash. To see a list of cities they're currently in, check out lyft.com/cities. 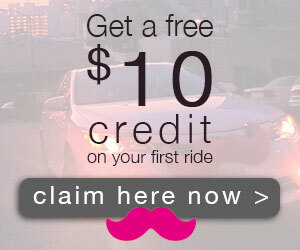 Your free $10 credit will be automatically applied and used on your first ride. If your ride is short, it could be entirely free.